Despite a strong run for equities the past few months, shares of iRobot (IRBT) are down more than 20% from their 52 week high of $41 set in July. Best known for their robotic cleaning devices such as the floor-vacuuming Roomba, iRobot disappointed investors with their 3rd Quarter results, reporting revenue and guidance that came in below analyst expectations. IRBT shares are currently in a bearish descending triangle pattern which began in July, and are near a key support level around $32.40. The pattern indicates that demand for their shares has been declining, with a series of lower highs made each time IRBT has bounced off support the past 5 months. 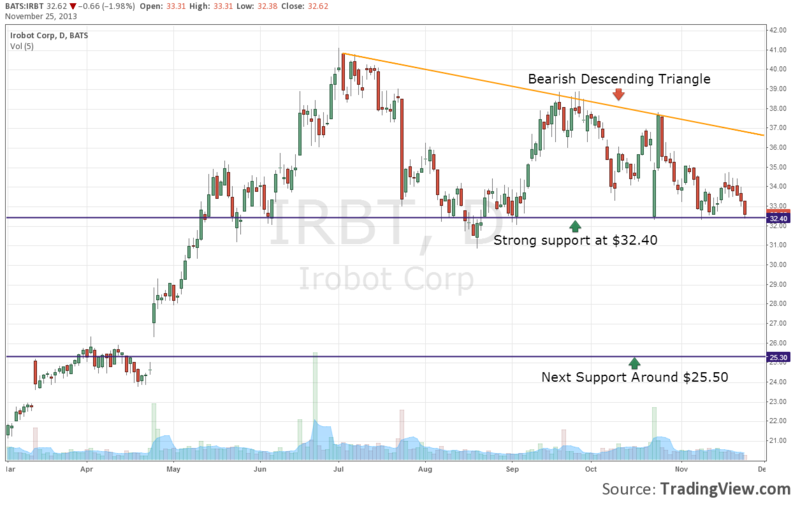 Traders should pay close attention to the price action of IRBT stock this week as it tests $32.40. A break to the downside would trigger a sell signal with their chart showing no levels of support to the downside until the $25- 26 range.